There you go! 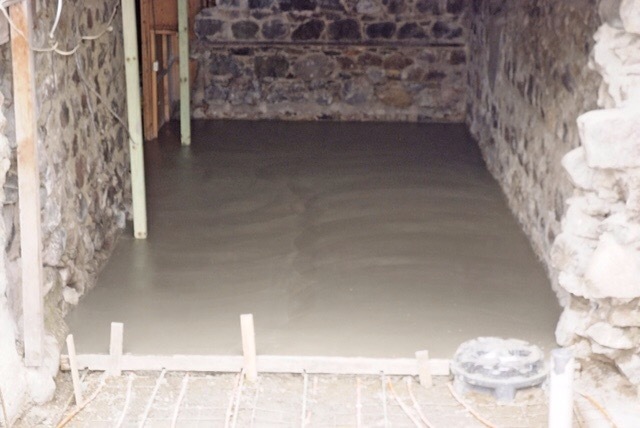 We have a fresh concrete floor in the Stone Bank’s basement. This is the room where there were two heating fuel tanks for the building’s old boiler and the floor was dirty, crumbling concrete. In the lower right of the photo above, the black circular object is the top of our recently installed sewage lift pump. PROGRESS x 2. 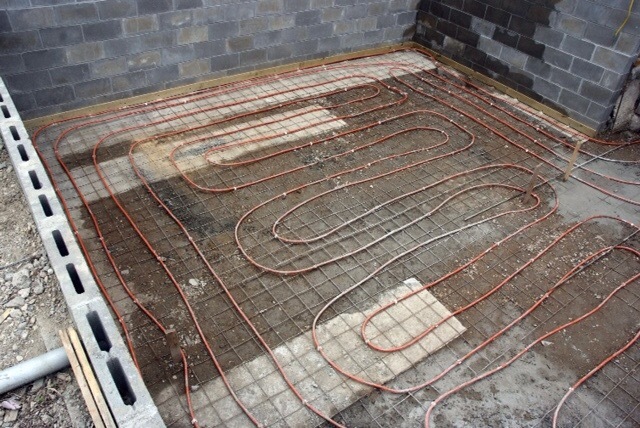 Here is the in-floor heating in the part of the building that we took down and are putting back together. A concrete floor will be poured over the heat elements. In-floor heat! Pretty cool update for an old building in a cold climate. Now, the back 20-feet of the building has nice deep footings to support the weight of a stone-clad structure. 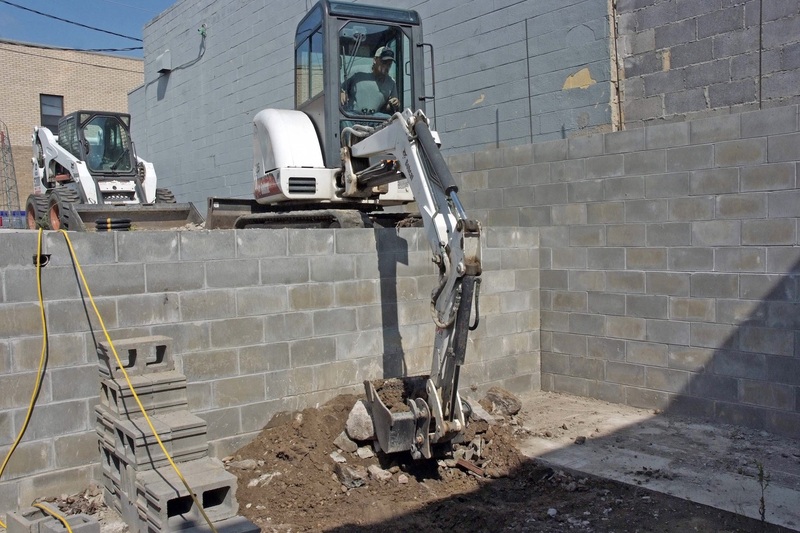 When our nonprofit purchased the Stone Bank in 2011, the back section of the building had only a crawl space — and the back wall of the building was sinking, because it was resting on footings that were much too shallow. 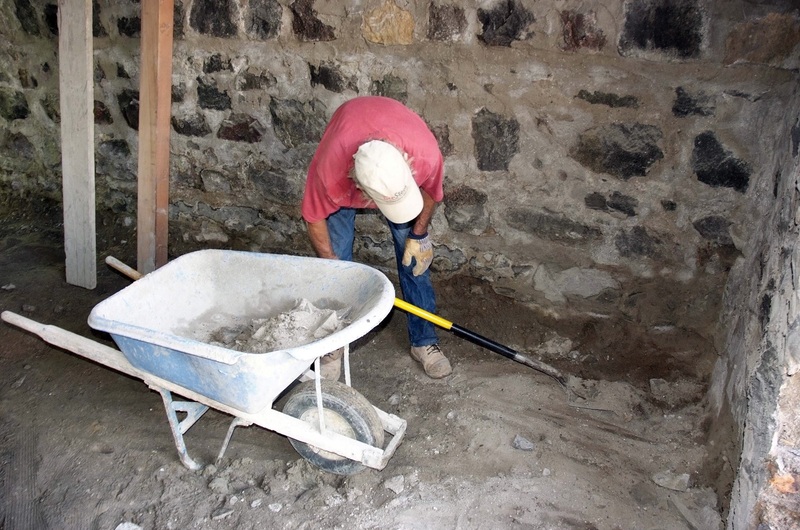 When complete, the back of the Stone Bank will look much the same as it did when we started the project, but it will have a much sturdier foundation, a handicap entrance and two handicap-accessible restrooms. That’s the way you take a building from 1900 into 2015 — and beyond. Do you want to be part of the Stone Bank project? We always welcome volunteers, but right now, we really need donations to keep the ball — or stone — rolling on enclosing the back of the building. Your donations will help us match a generous $20,000 grant from the Historical Society of ND. We also accept online gifts with PayPal and Razoo. The links are in the sidebar. As always, thanks for reading the Stone Bank blog. Please, share this post with your friends and family! Our Stone Bank contractors have been working hard to finish work in the basement — breaking up and hauling out the old concrete floor and creating a base for a new floor. After the crew broke up the old concrete, they hauled it into the new section of the basement where the rubble was taken away by backhoe. Crew members of Jim Berg Construction scooped up the remnants of the old basement floor inside the building to make way for a new, smooth concrete floor. Make no mistake. This was a tough job. We appreciate our contractors and their crews — because they are doing the hard part of making the building whole again. The result of all that hard work? A nice, smooth surface that will soon be a concrete basement floor. 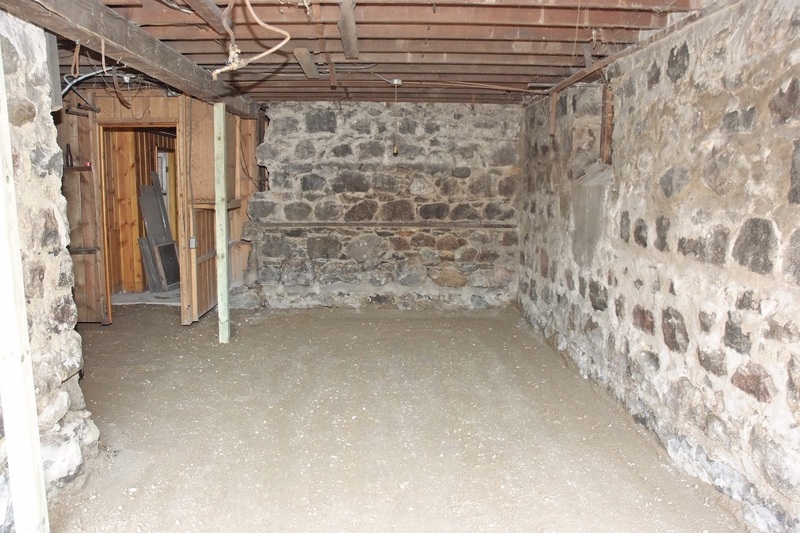 Notice the handsome stone walls in the basement. Built by immigrant craftsmen between July and December 1900. Wow! What a difference. 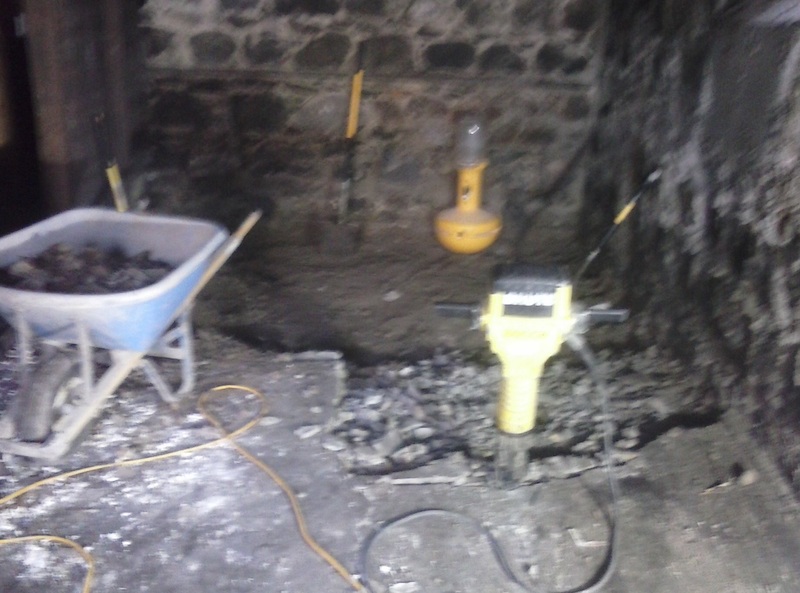 The basement is prepped and ready for a new concrete floor. For everyone who loves the Stone Bank, this is a beautiful sight. Check back here soon to see more progress on our restoration project. Want to be part of the action? We have some volunteer opportunities, but mosly we need donations. We must pay our contractors for all their heavy lifting — and for that we need cash. Any amount is welcome and all donations go directly into the restoration project. You don’t have to put out your back to do your part to save this historic building. Just pick up a pen and send a check today to Touchstones, Inc., P.O. Box 272, Bottineau, ND 58318. PayPal and Razoo online payment sites are linked in the sidebar. We are a 501(c)(3) nonprofit and your gift is tax deductible. Thanks for reading the Stone Bank blog! Oh, how it makes the Stone Bank blogger happy to see a great old building with a new lease on life. Right there on Main Street in Red Wing, Minn., is a Caribou Coffee in a red brick railway station from 1906. Not too crazy about the interior, but it’s just great to see this building standing, sturdy and useful. Hurrah. We want the same for our Stone Bank. Sturdy and useful and IN USE for the next 100 years or more. For comparison’s sake: Bottineau County Bank (what we now call the Stone Bank) was founded in 1887. The Stone Bank was built in the last six months in 1900 — and replaced an earlier wood-frame building. It was Bottineau’s first bank, which failed in 1923. The building had many uses over the years and most recently was a lawyer’s office. We know that our restoration project will give it a new life in the next couple of years. Do you have a favorite restored building in your home town or someplace you have visited? What was it built for and how is it now used? Send a photo and we will post it. Thanks for reading the Stone Bank blog. Comments and contributions always welcome. Maybe it’s the stone. Maybe it’s the guys. But there is something so timeless about many of the pictures we have taken of the work on the Stone Bank. Here is one of my favorites. It was taken in November of 2011, as Joe and his crew started taking down the first course of stones on the bank’s south wall. 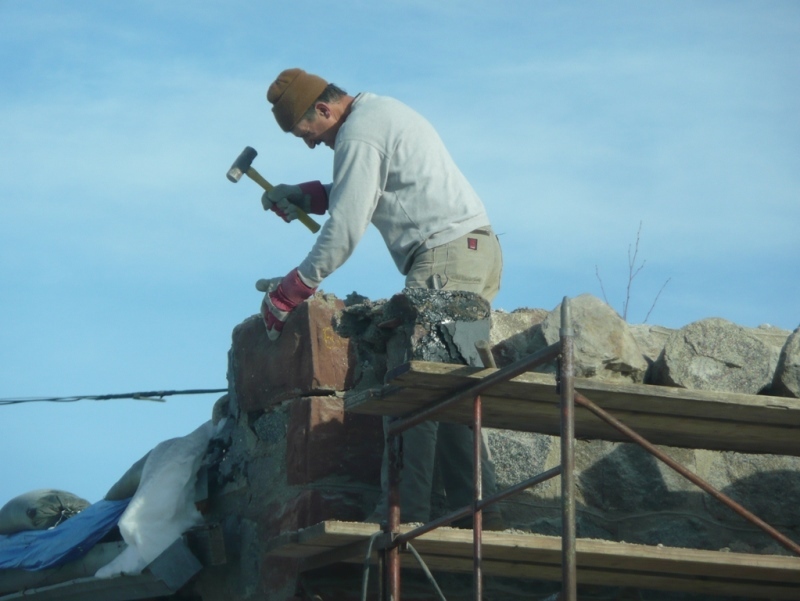 Nov. 22, 2011: Stone mason Joe Whetter began taking down 20 feet of the Stone Bank. Nearly two years ago to the day — we were taking the bank building apart. It has been an amazing process. Now we are hard at work putting it back together again. Check out all of our NaBloPoMo posts — this is Day 20 and we haven’t run out of things to talk about on the topic: Stone Bank. Another food post? You have a problem with that? Didn’t think so. Look what we recently found nestled in an old warehouse building in Minot, N.D. A great coffee shop with excellent pastries and food. It was our first encounter with Sweet and Flour (the eatery) and it surely won’t be our last. We found Sweet and Flour on Facebook. Their page has great photos and they post the daily specials each day. Sweet. Naturally, we had to stop by. What an interesting way to repurpose an old building into something useful and interesting. Hmm. I wonder how we can apply that idea in Bottineau? Let’s see. In case you have zoned out, we are on Day 17 of National Blog Posting Month. We have had two contributions and gained a few new blog followers — so we will blather on. Here’s a Stone Bank friend, Karen M., on her journey home from a visit to Bottineau. Look! Look! Karen wore her lovely Stone Bank T-shirt on the journey. Where are you wearing your Stone Bank T? We would love to share your photo here during #NaBloPoMo. Don’t have a T-shirt yet? Order one online or stop by 4J’s Sporting Goods on Main Street in Bottineau and pick one up. They make excellent traveling wear and stocking stuffers. Didn’t we promise a look at some other great Bottineau buildings? Let’s start with another great stone building that’s a scant block from the Stone Bank. It’s a charmer that is called the Saunders house, for the family that only recently sold the house. The original owner was W.R. McIntosh, a member of a prominent Bottineau family in the settlement era. These photos seem to show that the house had a addition at one time, because it is longer than in the original. It also looks as if the porch was removed at some point. Still, the building is remarkably intact at 117 years old. We should all look this good at 117. Wouldn’t it be great if buildings could talk? Stay tuned to the Stone Bank blog for more pictures of the great old buildings still in use in Bottineau. Do you have a story to tell about the Saunders house or a memory of the Stone Bank that you’d like to share? We’d love to hear from you. Leave a comment here, or send an email to Touchstones.Inc@gmail.com. We would love to learn more about these buildings from the people who lived or worked in them. As always, thanks for reading the Stone Bank blog! Let’s face it. The Stone Bank is very photogenic. Has been for 112 years. The play of light and clouds gives the stones a different look every single day of the year — so no matter how many pictures we shoot, we always see something new. A couple of days ago, your Stone Bank Blogger and her b.f. spent some time at the bank, trying to catch its many shadows and colors on a sunny day. The b.f. also discovered the “effects” button on his new camera and had some fun with it. (You know how it is. Give a man a button — and he’ll push it.) Anyway, these photos show off the Stone Bank in a new light, and we thought you’d like to see them. Indeed, it was 112 years ago this month that work began on the Stone Bank. Think of all that has changed in the world over those 112 years. And here stands the Stone Bank looking smart, strong and youthful and giving us a glimpse of how things were done all those years ago. If you are so disposed, send along a symbolic donation of $19.00 for the year 1900. Or $112 for the bank’s age. Or any and all numbers in between — or above. We have work to do this year on the Stone Bank and need some donations to make that happen. As always, thanks for reading the Stone Bank Blog. $5 million! That’s how much it would take to completely repair and restore the Coghlan Castle near St. John, N.D.
Not going to happen, says Becky Leonard, the spark plug behind saving this striking and rare stone building. Becky and other Coghlan Castle fans have worked hard to stabilize the building and to make critical repairs to keep it standing. More stone will be reattached to the facade — but, for now, that’s about where the project will stand. I have misplaced my notes from my lunch with Becky, who has been involved in historic preservation for years. But she is to be complimented for pushing hard to save this building. She said the the architect hopes to some day finish one room in the castle, so people can get inside and see it. Right now, the stone restoration work will continue and the interpretive sign will likely be placed this summer. The truth is that we can’t always bring a building all the way back — but this is a great intermediary stop. Save the structure and keep dreaming. I often think of the pioneers and dreamers who built these fantastic stone buildings for us to enjoy more than 100 years later. Dream on. If I ever win the lottery — I’m sending a big, fat donation to the Coghlan Castle restoration. Here’s a link to a National Park Service site about the Coghlan Castle. And, here’s a link to an earlier Stone Bank Blog post that shows how we are repairing the Stone Bank’s walls in much the same way as employed at the Coghlan Castle. What do you think? We’re always interested to hear from readers. 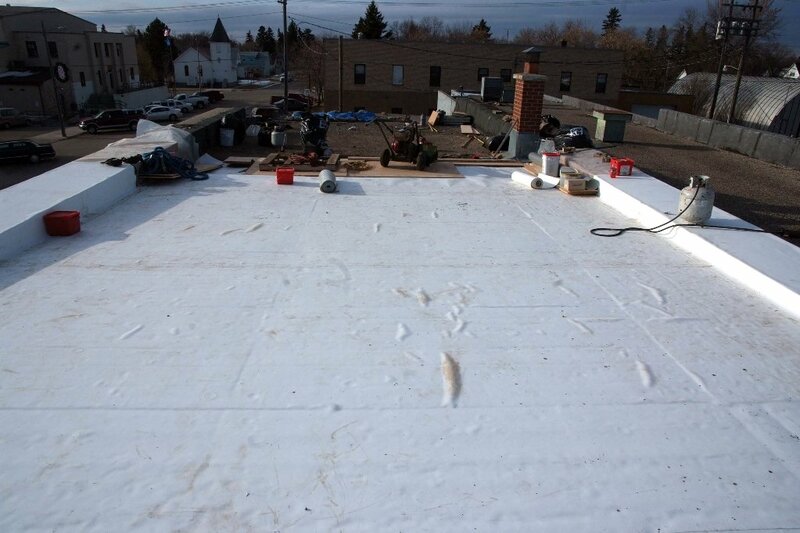 Following are pictures of the Stone Bank’s roof in a sort of “before and after” scenario. 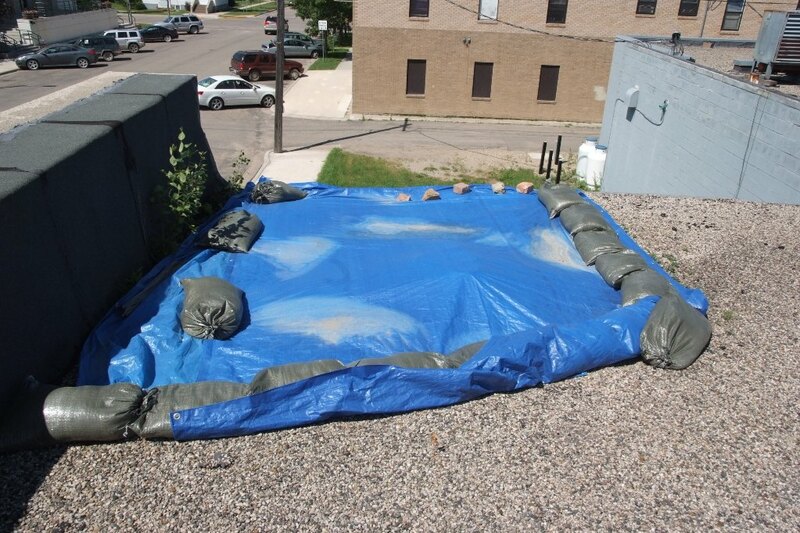 The “before” pictures were taken on July 12, 2011 — when our nonprofit was deciding to take on this project in earnest. The “after” pictures were taken Dec. 2, 2011, after two-days’ work by the crew from Skinner Roofing. 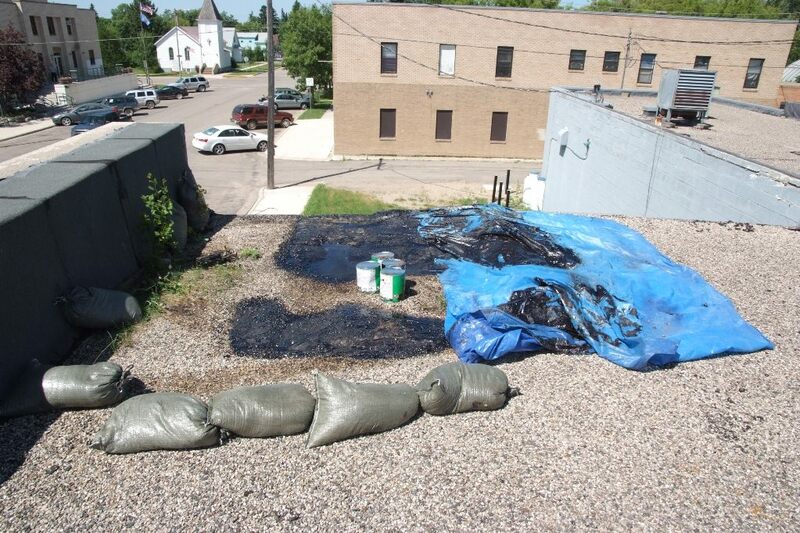 This shot (facing east) shows the Stone Bank's old asphalt roofing -- which was leaking all over the place. In an effort to stem the flow of water into the rear of the Stone Bank, a volunteer used sandbags and a tarp to redirect the water. It helped a little. It was a soft and gooey mess under the tarp. This is the section of the building being dismantled in the next couple of weeks. 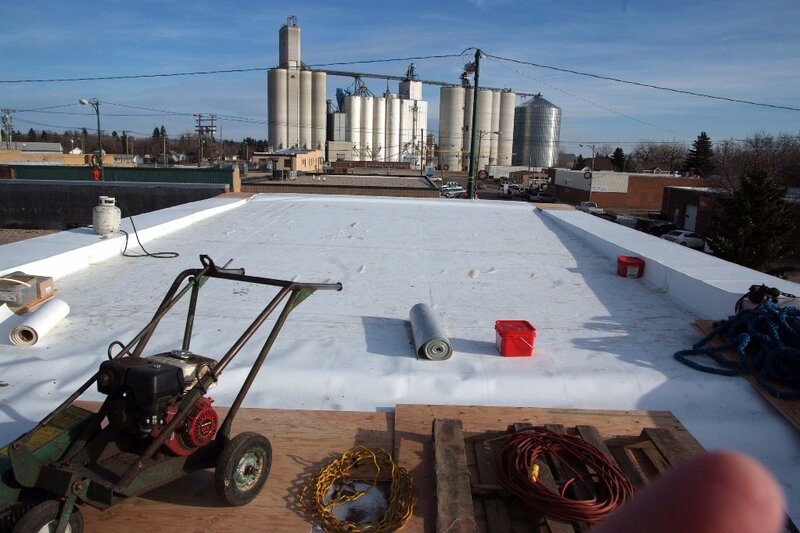 The new view facing east, shows the new roof membrane mostly in place. Neat. Tidy. And no longer leaking. The view looking west (toward the section of the building being dismantled). The membrane roof will be extended to that section, when it is rebuilt in 2012. 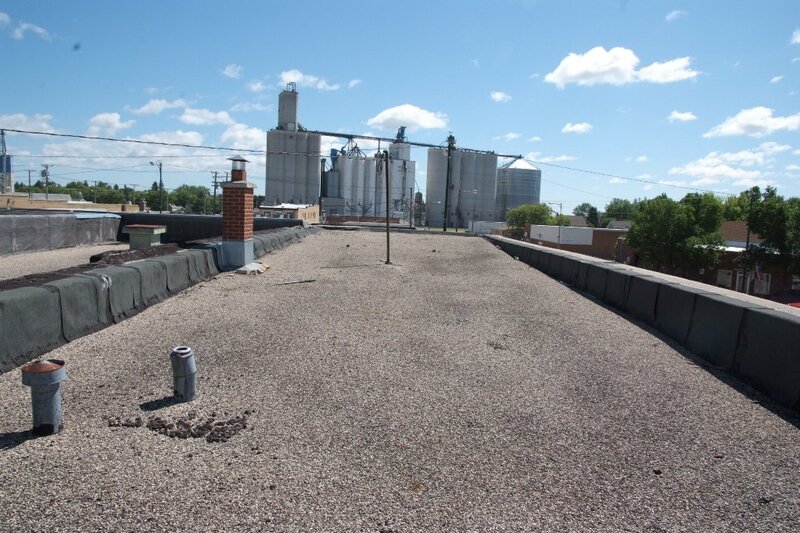 This expensive and necessary roofing work would not have been possible without a grant from the State Historical Society of North Dakota and a zero-percent loan from the Bottineau EDC. Our thanks to Scott Wagar for these photos.